The cold… the wind… having to bundle up before going outside… people just aren’t happy. But can I tell you a secret? I actually love winter. The longer I homestead, the more I appreciate the cycles of nature, and savor the shifts. Welcoming new life in the spring, working hard in the summer, harvesting in the fall, and hibernating in the winter… I crave the rhythm and honestly appreciate the quieter, colder months when I can spend more time resting, rejuvenating, and consuming good books by the light of the wood stove. 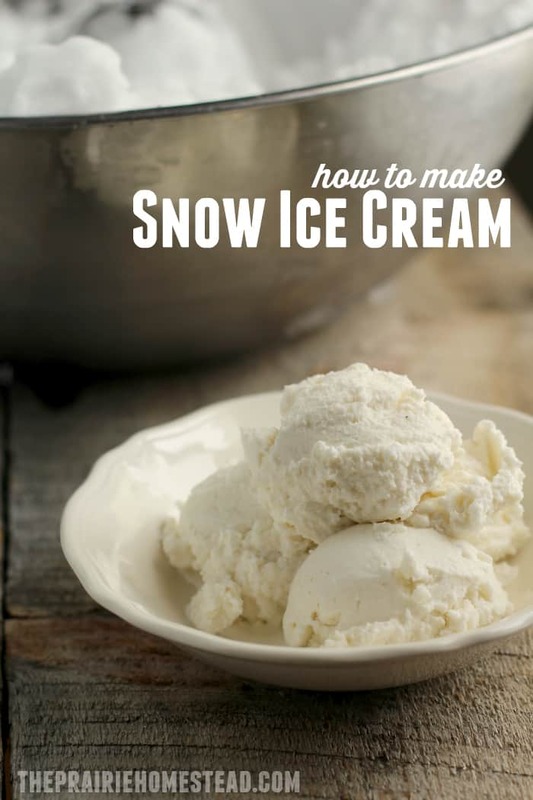 And I just found a new reason to love winter: this snow ice cream recipe. Because when you’re buried under several feet of snow drifts, why not put that snow to good use? One caveat: If you’re looking for a perfectly smooth gourmet ice cream recipe, this isn’t it. (But you probably will enjoy my simple raw vanilla ice cream instead!). 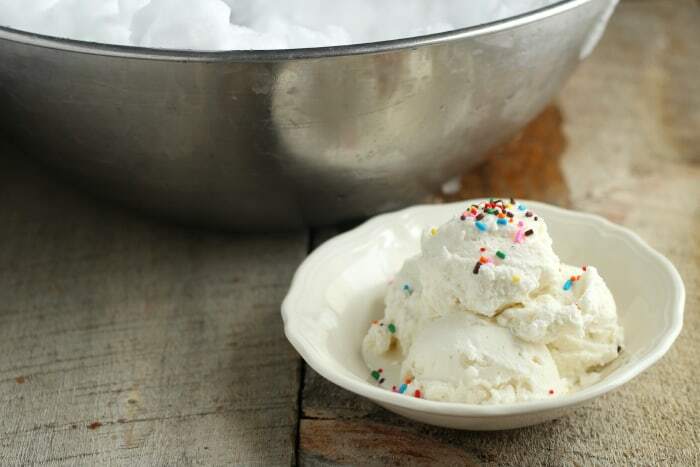 However, snow ice cream is a fun way to make memories, and the kids (or grandkids) will get a huge kick out of it. Oh! And make sure you’re using local, organic, GMO-free snow… Of course…. 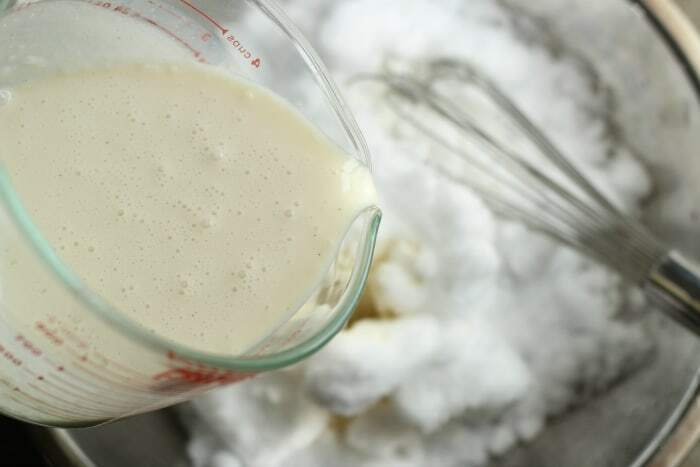 In a small bowl, whisk together the cream, maple syrup, vanilla, and salt. 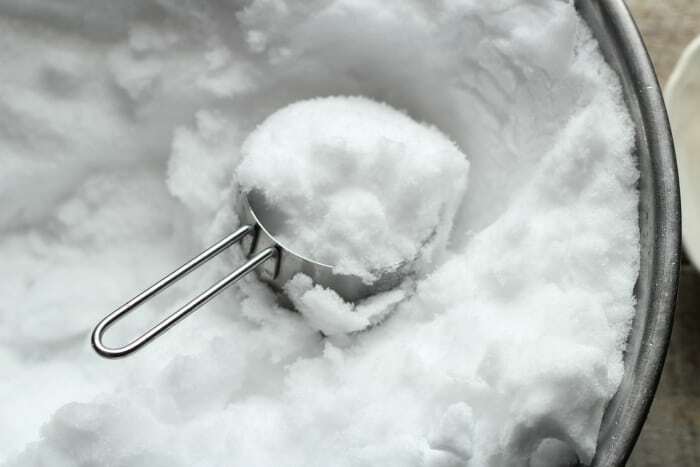 Quickly pour this mixture over the snow, and mix thoroughly. Eat immediately, as snow ice cream melts fast. It also doesn’t refreeze well, so you’ll want to eat the entire batch in one sitting. If you don’t have maple syrup, you can substitute 1/2 cup of granulated sugar instead. I especially like this evaporated cane sugar. I don’t think I really need to tell you this, but I’ll say it anyway– don’t use dirty snow. 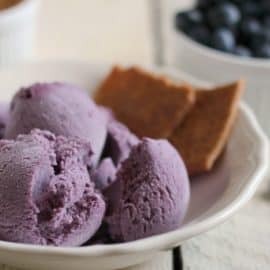 If you’re plum out of clean snow, you could also use shaved ice in the recipe instead. If you don’t have cream, you can use whole milk, half n’ half, or coconut milk instead. But cream is the best. And the bigger question here is WHY do you not have cream?! If you want to be really wild and crazy, top your freshly-made snow ice cream with sprinkles, fresh fruit, or homemade caramel sauce. 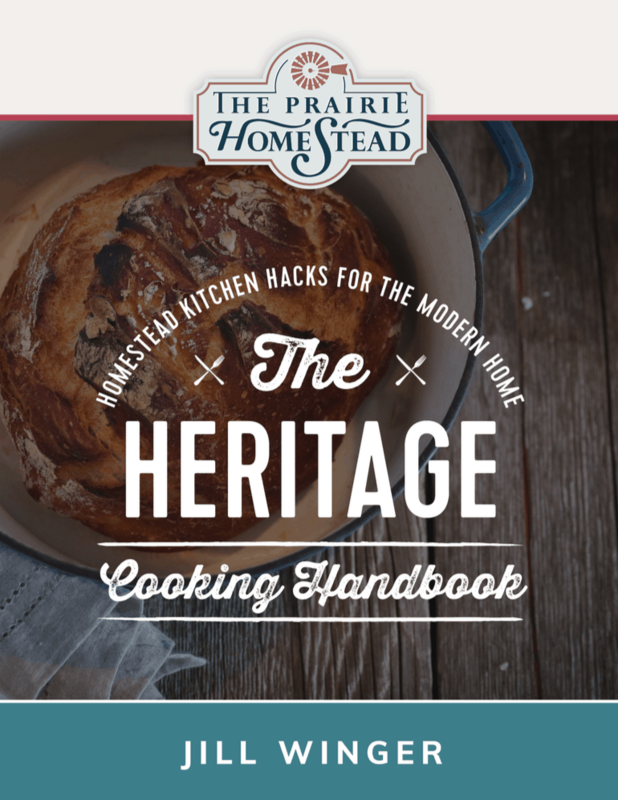 Get my top homestead cooking hacks for bringing farmhouse vibes into your kitchen… no matter where you live (no farm required!) Includes 10 recipes for my favorite pantry staples, how to transform your cooking style with simple ingredient swaps, tips for caring for vintage kitchen tools, and more! 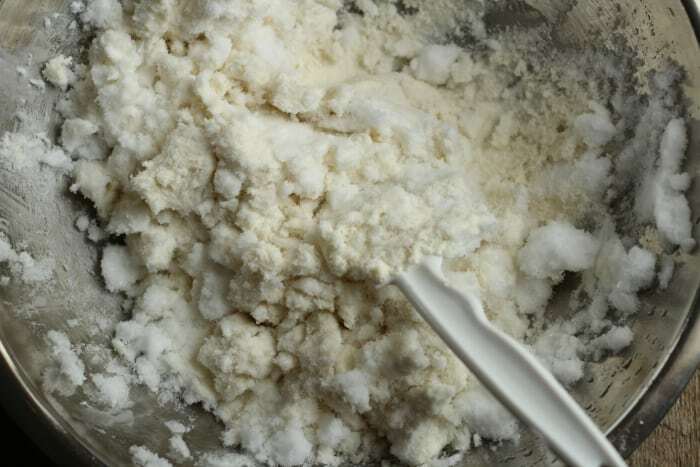 I just made snow ice cream yesterday for my youngest…. Thanks for sharing your recipe! My dad always made us kods snow cream every winter when it snowed a bunch. When I had kids of my own, I made it for them. And Im pretty sure when they have kids of their own (theyre 20 and 21 now) they will carry on this tradition. We always used sugar instead of syrup, though. I had just had a conversation with a friend this week about making snow ice cream. We didn’t have a recipe. This is right on time, we have lots of snow to give it a whirl! Thanks! Woot! Love timing like that. I would NOT eat snow, fresh or otherwise. My daughter melted fresh-fallen snow in clear glass jars for a science-fair project. The water was murky and full of debris. Maybe melt some in a jar first and see if your snow is clean. Weather and pollutants will probably vary. I agree, check your melted snow first for cleanliness. Our atmosphere is very polluted these days. Here in south western Ohio you always see jets flying across the sky leaving dense trails of exhaust that eventually spread out and cover the sky. Some days there are several crisscrossing the sky at once. I’ve heard people call the exhaust “chemtrails”, probably because of all the chemical pollution they carry. It has to fall down to us and that can’t be very healthy to consume. 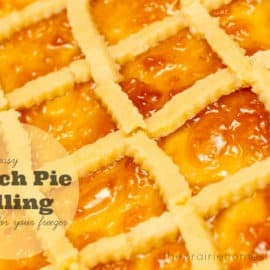 I wanted to thank you for this one, we tried it last night for dessert and are making it again tonight. 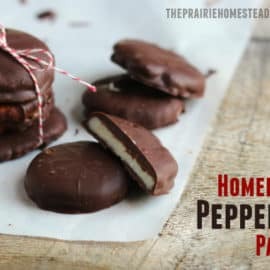 This is so easy, a lot of fun, delicious, and my 3 year-old loves to help since it isn’t a very time-consuming or labour intensive job. This will now be a part of our snow-day tradition! As for the comment about not eating snow….the way I see it, I have ingested a lot worse than this, I have no problem eating untouched fresh snow. And frankly, anything that makes dreary snowy days a little more fun is great!! Thanks again for this! YAY! So glad it was a hit! 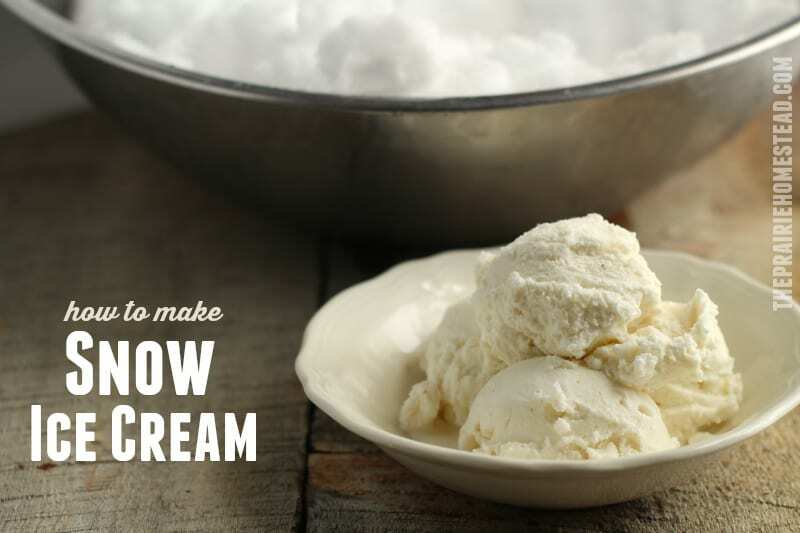 My grandmother used to make us snow ice cream all the time. It was wonderful. This was in the middle of downtown in the 1950s-60s. We need to make this for our grand daughter! This is seriously ten times better than the ole’ salt, ice and machine cranking method, I’d never even hard of it til now. Alright, now I DO need that milk cow… I’m conspiring to actually milk a Highland Cow this spring, we’ll see! Genius recipe, I just love your easy-going and inspirational website! Oh, I loved snow ice cream as a kid!! Wish we had enough snow here so I could make this! I totally agree on actually liking winter now that I am a homesteader! (If you had told me 5 years ago that the words “like” and “winter” were going to be in the same sentence coming from me – I am sure I would not have believed it ?) I actually get to read books and sew in the winter! Question……Where did these prairie homesteaders get sea salt? 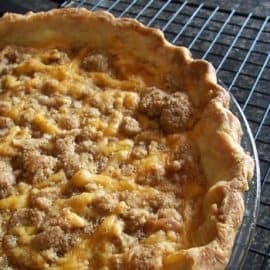 My grandmother use to make this for us every year…was always a special treat, she also some cinnamon in hers. She also said to never use the first snowfall of the season, not exactly sure why. Let’s see … Jill’s Chocolate Sauce has maple syrup in it. Jill’s Snow Ice Cream has maple syrup in it. Vermont may have to make you an honorary citizen! My younger children have made MANY batches of snow ice cream this season – with each new snowfall there’s been a new batch. They’ve made chocolate snow cream too by adding cocoa powder. It’s making fun memories as well as a fun treat. =) Even country kid wanna be’s can enjoy this treat. We have 6 inches of beautiful new snow this morning and I’m guessing there will be more snow cream later. Wow I have never heard of snow ice cream before. But I want to try it and we do have snow. Thanks for the recipe. We are surviving an Arctic blast and figured there was no better way to celebrate the cold and snow than to make ice cream! We had so much fun! Thanks!!! Get the Cookbook + Over $130 in Bonuses!